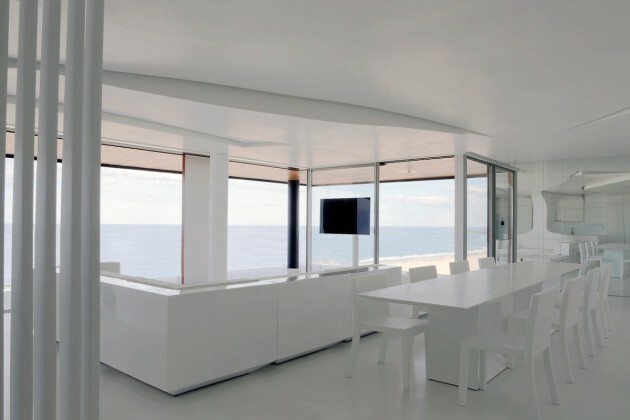 A-cero have designed an incredibly white minimalist penthouse apartment in Costa Blanca, Spain. 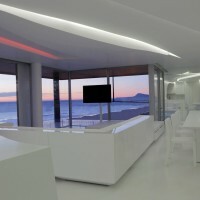 This penthouse reform of 218 sqm is placed in a town of the coast of Valencia, Spain. 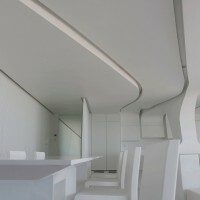 The apartment has an area of 175 sqm and the terrace has 43 sqm, which makes a total of 218m2. 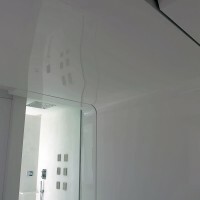 Access to housing is given through a hall of 6 sqm. 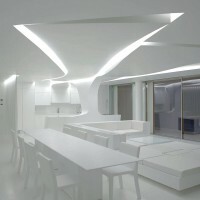 First we found a great diaphanous space: the living room of 55 sqm, and the kitchen with 14.5 sqm. 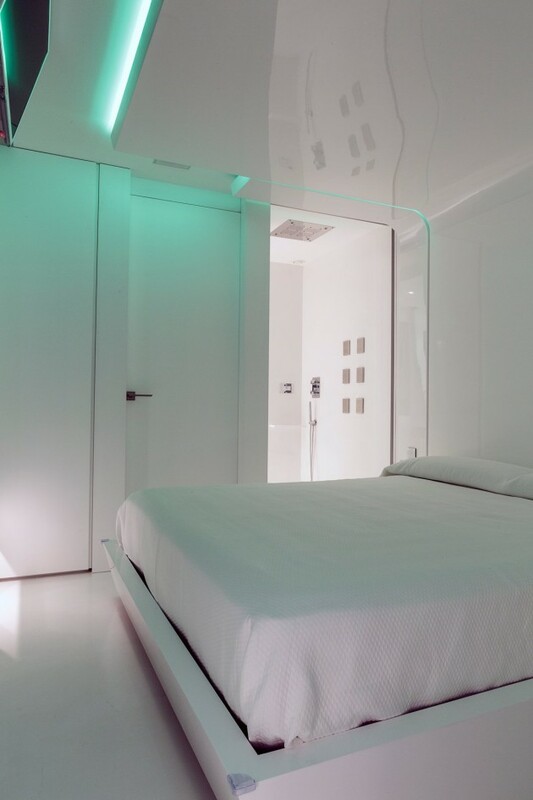 Other spaces that complete this apartment are the hallway, the pantry, the laundry room (located on the back of the kitchen), the master bedroom with dressing room and bathroom with a total area of 27sqm and finally two secondary bedrooms of 17 sqm, with bathroom in suite. 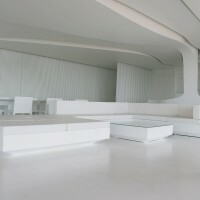 White is the main character of this project. 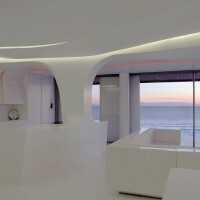 The property is located in the “Costa Blanca / white coast” in Valencia. 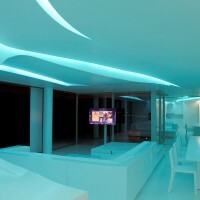 This provides enormous luminosity inside. 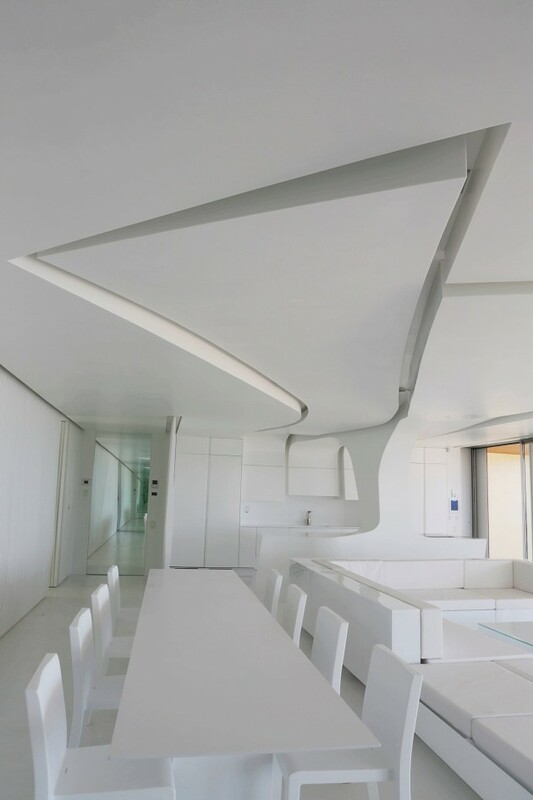 The sinuous shapes are also relevant in this project with the views focused to the environment extending to the sea. 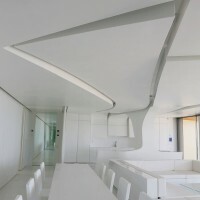 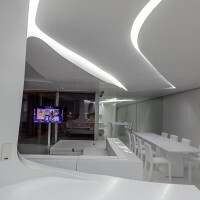 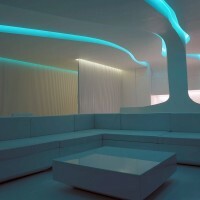 We have designed a ceiling whose curves are resolved in white glow Krion by Porcelanosa. 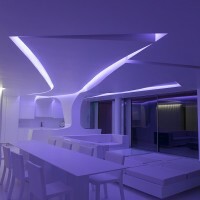 This ceiling goes through walls also, and has indirect LED lighting that changes colour to create different atmospheres and feelings. 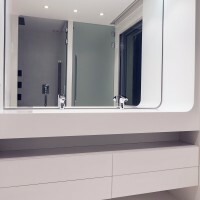 The interior woodwork: interior doors, closets and dressing are done in white lacquered. 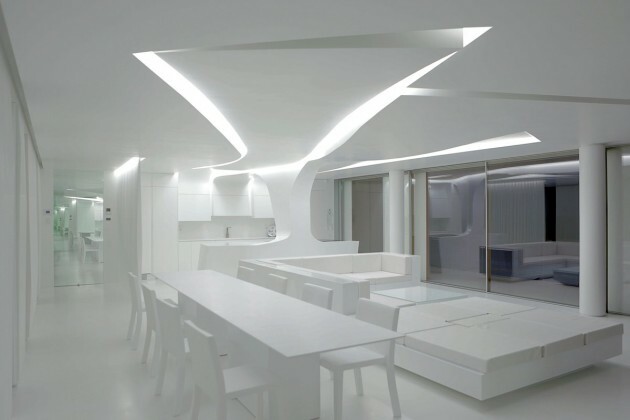 A mirrored wall at the back of the hall gives more depth to this home. 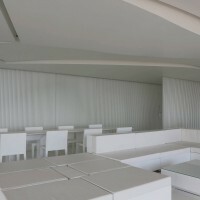 Furthermore, the finished for the horizontal parameters of the house use a white plastic colour, except from the living room where vertical parameters are followed with overlapping slats Krion. 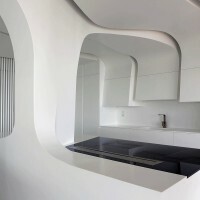 The kitchen is exclusively designed by A-cero. 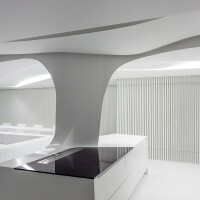 It has sinuous forms and is also made with the material Krion by Porcelanosa. 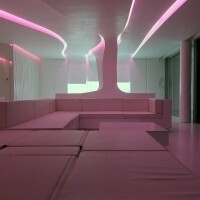 The rest of the furniture is designed by A-cero, such as beds, tables, bedrooms, bathrooms… while the living room sofas, chairs and dining tables are designed and manufactured by the international firm Vondom. 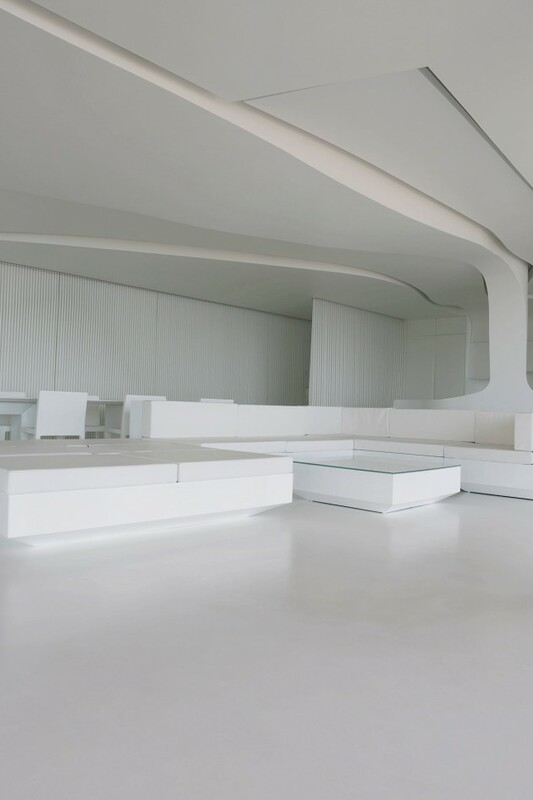 Everything is white and suit perfectly with the concept of this holiday housing.